This "Surprise Egg" was made by Stuart Devlin in 1971. It is sightly more unusual than others that we have had as the "eggshell" is in gilded silver wire work. 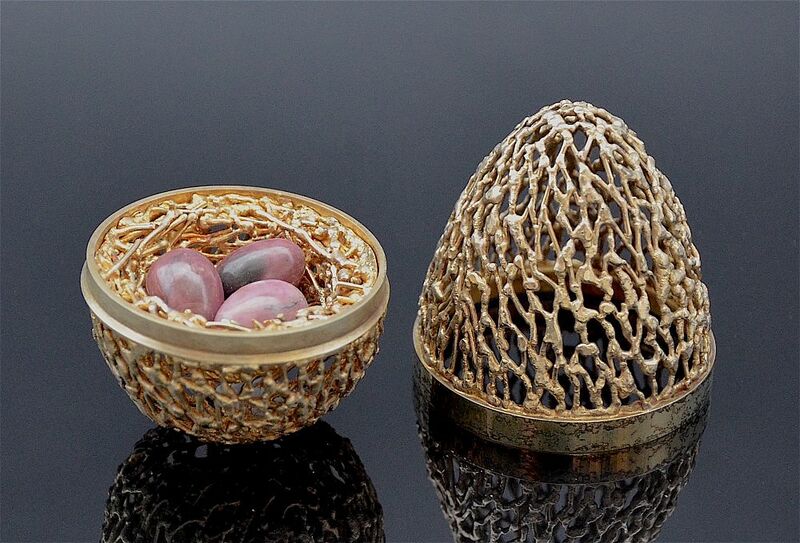 It opens to reveal a gilded silver nest containing 3 pink/black rhodenite eggs nestling in the centre. The egg is hallmarked by the London Assay Office for 1971 & silver and the sponsor's mark "SD" for Stuart Devlin. It has also been numbered but I am not sure whether the number is "75" or "15". It is presented in a red silk & velvet lined box.